The winners of the 39th Metro Manila Film Festival (MMFF 2013) were announced by the organizers Friday night, December 27, 2013, during its Gabi ng Parangal (Awards Night) at the Meralco Theater, in Ortigas Center, Pasig City. 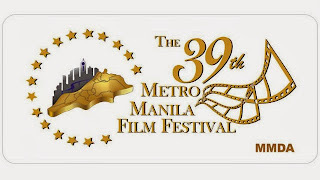 The 39th Metro Manila Film Festival (MMFF) is a part of the annual film festival in Metro Manila, Philippines that will be held from December 25, 2013 until the first week of January, 2014. During the festival, no foreign films are shown in Philippine theaters in order to showcase locally produced films. This year, 15 entries were submitted but only 8 were chosen by the MMDA. Contrary to the tradition, the Enteng Kabisote, Panday, and Shake, Rattle & Roll films will not be joining this year's MMFF.